The anhinga, aka snake bird, water turkey and others, is that bird whose head and neck you see sticking above the water. They dive and spear fish with their sharp, pointed beak. Cormorants fish in a similar fashion but grasp their prey, the have a little hook on the end of their beak with which to do this. Anhingas must dry their wings after swimming because, due to the lack of sufficient oils, they get saturated and the bird can't fly. They find all sorts of perches on which to wait for the drying process to work. 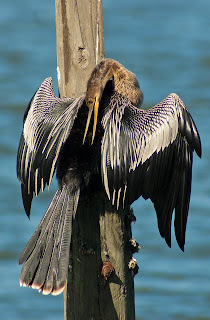 This one has a very precarious perch on an old piling at Mt Dora's lakefront. It was a hot sunny day so he didn't have to hold on for too long.